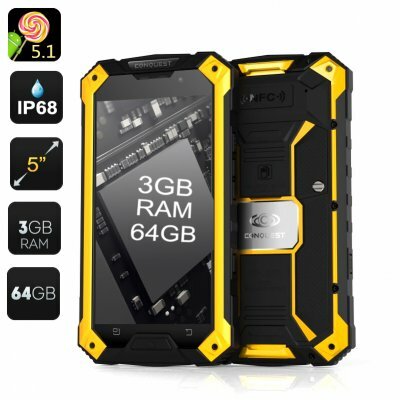 Successfully Added Conquest S6 Pro Rugged Smartphone – 3GB RAM, 64GB Memory, 5 Inch Screen, Gorilla Glass, Android 5.1, IP68 (Yellow) to your Shopping Cart. The Conquest S6 Pro is a rugged smartphone with a 5 inch screen well protected by Gorilla Glass, Android 5.1 operating system, 3GB of RAM, 4 G connectivity and more. The Conquest S6 comes with a nice 5 inch screen sporting the 1280x720 resolution. Great for media play, the screen is also well-protected by Gorilla Glass and is resistant to various sources of damage. The phone features IP68 rating – it is totally dust tight and protected against immersion in water under pressure. The rugged smartphone is great to use outdoors or to bring along on an extreme adventure. If your work occasionally requires you to tough it out – the Conquest S6 Pro will be the perfect fit. The Conquest S6 Pro comes with lots of modern features to keep you entertained and connected. Featuring Android 5.1 operating system, the phone offers a friendly and intuitive interface. You can always swing by the Play Store for extra functionality and pick up a few new apps and tools. The S6 comes with strong connectivity, giving you quad band coverage, including 4G. With two SIM cards, you will also be able to easily manage your business and social calls from different accounts – if needed. One of the many highlights of the smartphone is its huge 6000mAh battery offering 16 hours of talk time and about 700 hours on standby. This is more than enough to not only keep your phone charged for several days straight, so even if your away from a power source it will keep you connected. The Conquest S6 Pro 3GB rugged smartphone comes with a 12 months warranty, brought to you by the leader in electronic devices as well as wholesale Android Phones..
Price Guarantee: As of April 26th 2016 until September 14th 2016 when purchasing this product you can enjoy the security of our Price Guarantee. This ensures that if the product price on our webpage changes, within 3 months of your purchase, we will happily refund any difference in the price that you paid and the advertised price on our webpage. If you notice a price difference between the advertised price on our webpage and what you paid please contact our Customer Service Department with your purchase details so we can refund your account.